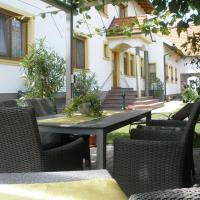 Burgenland Vacation homes Bed and Breakfast Hotels for an unforgettable holiday. View our array of holiday homes, bungalows, apartments and book your vacation home here. Featuring free WiFi throughout the property, Weingut Gästehaus Nationalparkhof Gartner is situated in Illmitz, 1 km from National Park Neusiedlersee-Seewinkel. The rooms have a flat-screen TV with cable channels. Certain rooms include a seating area where you can relax. Every room includes a private bathroom. You will find room service at the property. Vienna International Airport is 43 km away. We speak your language! Booked once in the last 48 hours. The bright Accommodation, air-conditioned rooms at B&B Domizil Gols, Hotel Garni come with parquet flooring, a safe, a private bathroom and a flat-screen TV with cable channels. Guests receive a welcome drink (frizzante or grape juice) and 1 bottle of mineral water. The breakfast buffet features homemade jams, cakes and syrup, regional grape and apple juices, and locally roasted coffee. Wine tastings and wine shopping are offered on request at the property’s own winery which is in the immediate vicinity. A big wine store is just 200 m away, and the local vinotheque is also close by. There are many typical Heurigen wine taverns in the village. Situated next to the bicycle trail on the outskirts of Rust, Pension Drahteselböck is a 5-minute drive from Lake Neusiedl. It offers bicycle storage, bicycle rental, and a protein-rich breakfast. The large garden awaits guests with an outdoor pool and a sun terrace. The modern rooms feature a balcony overlooking the garden, a seating area, and a bathroom. A selection of alcoholic and non-alcoholic drinks, as well as organic snacks such as goat cheese and organic sausages are available around the clock at a surcharge. Fresh fruit and pastries are provided free of charge in the relaxation area. Free private parking is available, and electric bicycles can be rented on site. Mörbisch is 5 km away from the Drahteselböck, and it is 13 km to Eisenstadt and 20 km to Sopron. The Parndorf Designer Outlet Centre is 31 km away, and Vienna Airport is 50 km from Pension Drahteselböck. The 4-star superior Avita Hotel Bad Tatzmannsdorf offers direct access to the Avita Thermal Spa with an indoor and outdoor swimming pool, a sun bed, a hot tub, a sauna and massages. It also features a private spa for hotel guests only, a gym (daily open from 07:00), and a bar and a restaurant with terrace. Rich half-board consisting of a breakfast buffet with egg dishes and products from the region, a salad, soup and snack lunch buffet and dinner buffet with a salad bar is available every day. The restaurant offers Austrian and international cuisine. The air-conditioned rooms of Avita Hotel include a private bathroom with bathrobes, spa towels and slippers, a minibar and satellite TV. Free WiFi is provided in the entire building and the entrance to the Avita Thermal Spa is included in the rate. There is a natural swimming pond in the garden. E-bikes can be rented at a surcharge, while bicycles are available free of charge. Tennis courts and soccer arena are 250 m away. Golf & Country Club Bad Tatzmannsdorf is 2 km from the property. The private spa area which is exclusive for hotel guests only comprises an indoor and outdoor pool, a steam bath, a panorama sauna, an infrared cabin, and a bar with tea and fruits. The town centre can be reached in a 10-minute walk. A bus stop is 700 m away and the Oberwart Shopping Centre is 5 km from the property. Active holidays in Burgenland are popular because of the ideal natural conditions. Burgenland Austria Hotels Take A Break Holidays. Music and Wine in Austria’s Burgenland. Austria’s Burgenland province is unique in that it combines beautiful landscapes and nature reserves, vineyards that have been family owned for generations and yield some of Austria’s best wines, as well as unrivaled classical music festivals inspired by Joseph Haydn and Franz Liszt. Take A Break Holidays takeabreakholidays, Burgenland Accommodation.